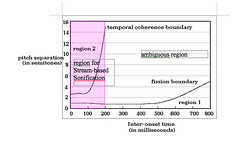 The method for designing stream-based Sonifications has Schema and Pre-attentive levels modelled on the theory of Auditory Scene Analysis. The Stream-based Sonification Diagram provides a way to control the perception of grouping and segregation at the pre-attentive level. Several different diagrams have so far been tested. The first extends the Van Noorden diagram from pitch of a tone to brightness of a noise grain. The next extends the diagram to streaming by spatial location. The diagram is extendable to other auditory perceptions and may be a general tool for designing the emergence of auditory figure/ground perceptions from data relations. Here are some example of the stimuli used to map the boundaries of the Stream-Based Sonification Diagram for the brightness of a noise grain. Sometimes this will sound like a single stream gallop, while at others it will seperate into a low double and high single. The effect is similar to the visual Necker cube illusion. Barrass, S. and Best, G. (2008). Stream-based sonification diagrams. International Conference on Auditory Display, Paris, 2008.